You are here: Home / Classic Cars / 1956 Chrysler – A Necessary Change! In 1955 all Chrysler cars were redesigned by Virgil Exner, which was a great idea as can be seen in the photos below. The Windsor was the top of the line for Chrysler in the years 1951 through the 1960 model year and it was Chrysler’s price leader. This 1954 Chrysler Windsor above looks like it came right out of the 1940s and an entirely different generation than the rest of the 1950s. In 1956 the “Forward Look” style was introduced which included the first Chrysler tail fins and the Highway Hi-Fi phonograph player was an option. I wonder how one kept the records from skipping when going over a bump? The 1956 Chrysler Windsor Newport above is definitely a big step forward compared to the 1954 model. The Chrysler 300 “letter series” models were high performance luxury cars introduced in 1955. The 1956 300B was similar to the 1956 Windsor except the 300B had better performance and a split grille instead of a single grille across the front and maybe some other small cosmetic differences. With the optional 355 hp 354 cid engine (yes a Hemi), the 300B became the first American car to produce one horsepower per cubic inch, beating Chevrolet with their fuel-injected 283 cid by one year. 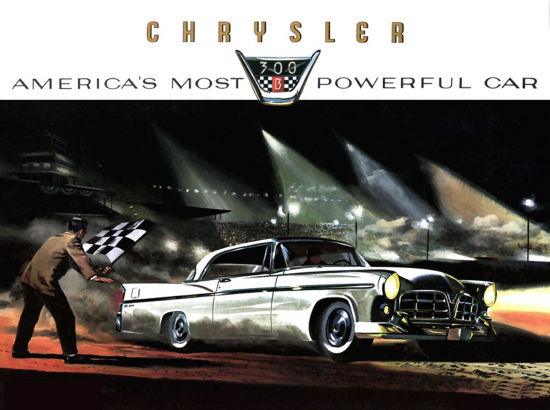 The 300 “letter series” were successful on Nascar circuits and at Bonneville which gave Chrysler some marketing muscle – America’s Most Powerful Car. I like the tail fins on the 1956 300B (which is the same as the Windsor) better than any other tail fins – maybe because I drove a 1956 Windsor for a few years in my youth. I also learned to love the push button transmission. Yes, I would like to own a Chrysler 300B as long as it had air-conditioning. 1956 Chrysler - A Necessary Change! The Chrysler "Forward Look" style made all the difference, that and a Hemi. DAM YOU MIKE, YOU HAVE UPSET ME, HA! HA! YES I OWNED A 56 CHRYSLER 300 B AND SINCE I SOLD IT YRS AGO, IT ALMOST THE CAR I MISS MORE THAN, THE OTHER CARS I HAVE OWNED, JUST CAN NOT UNDERSTAND WHY I LET IT GO, AS ITS NOW IN A CALIF MUSEUM. AND I HAVE GONE THERE MANY TIMES,JUST TO ENJOY SEEING WHAT A STUNNING CAR IT WAS. AND AS YOU KNOW I HAVE OWNED OVER 300 CARS SINCE I WAS 16, AND YES, I AM SURE THERE ARE MANY CAR GUYS WHO HAVE SOLD THEIR CARS ALSO, AND WE ALL HAVE THOUGHTS, AS TO WHY WE DID NOT KEEP THESE VERY SPECIAL CARS. BUT IT IS GREAT TO HAVE OWNED SO MANY GREAT CARS, OVER THE YEARS. JUST WISH I HAD A FEW OF THOSE, THAT WHEN I SEE ANY OF THE ONE’S LIKE I HAVE OWNED, YES, LIKE ALL OF THOSE GUYS WHO HAVE DONE THE SAME AS I HAVE DONE, REALLY MISS, SOME OF THOSE CARS THAT WE ALL ENJOYED. AT LEASE I DO HAVE THOUSAND OF DETAIL BROCHURE’s & I LOVE WHAT I STILL HAVE, SO I CAN LOOK AT ANY CARS THAT I EITHER OWNED, OR THOSE THAT I COULD NOT AFFORD, BUT I HAVE BEEN VERY LUCKY TO OWN MANY CARS. VERY BEST TO ALL YOU CAR LOVERS. When I was in the Peace Corps in the mid-’60s in upcountry Sierra Leone, the taxi of preference in urban or semi-urban places was the Peugeot 403. Almost every one had a Phillips record player attached under the dash. The rotating “bed” for the 45 rpm disks was cleverly suspended on what seemed like a gyroscopic mechanism so that while the casing crashed and banged over impossibly rutted dirt roads, the needle on the arm valiantly remained in place — and the music was clear (and loud). That’s probably how Chrysler achieved similar results. No kidding, Ron! 125 Ferraris, mostly at $4,000 or $5,000. Oh well!